I had the paperback copy at home too, but I kept putting it aside for other things. I had never had this kind of reluctance before, and it was still rankling a bit when I saw the audio book again at the library last week and decided to tackle it again in a more stalwart frame of mind. The problem is that the deal is an all-or-nothing arrangement. There is a deadline, set in concrete, and unless there is 100% agreement, Mr Shah will take his money elsewhere. Or so the residents think. They pressure Masterji because they see their hopes of a better future fading. But what they don’t realise is that since Tower B was a pushover, full of ambitious young executives only too happy to desert their fading apartment block, Shah absolutely has to acquire Tower B or he will be stuck with land that is only half the size he needs to build his luxury complex. However, Shah has a ‘left-hand man’ called Shanmugham who helps him to get his way in situations like this. So Masterji is besieged on the one hand by Mrs. Rego and Mrs. Puri, Mr. Ajwani and Mr. Kudwa, and on the other by Shanmugham and his thinly-veiled threats. The tragedy of this scenario is that Masterji’s neighbours are corrupted by the deal. Masterji wants to stay where he is because he is old, and because his apartment is full of memories, of his wife who died just a year ago, and his newly graduated daughter who was killed when waiting for a train and pushed by the unheeding crowd onto the tracks. But his neighbours have their heart-rending stories too, especially Mrs Puri who is getting too old to care for her intellectually disabled son Ramu, and blind Mrs Pinto, who has memorised every bump in the stairwell wall so that she can still get about with some independence. The characterisation is so deftly done that the reader is torn between impatience with Masterji’s obstinacy and with his poignant desire to put his head in the sand and ignore the rampant development all around him because he just wants to keep his home. There are moments of droll humour, but the story takes a dark turn as one by one the community turns on Masterji. The narration by Sam Dastor is excellent: the huge cast of characters are all rendered as individuals and the subtlety of their moral corruption is well-paced and depicted with care so that nothing seems one-dimensional. 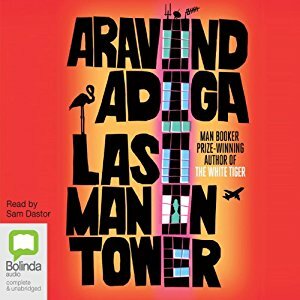 Time and again we see stories of communities displaced by the building of Olympic ‘villages’, new freeways and urban reconstruction – Last Man in Tower puts a human face on the phenomenon, showing us that the Big Bad Developer does not work alone. There are always others who benefit from development and their ethical standards can be just as flexible as his when money is involved. I meant to read this after the enjoyable White Tiger by the same author but my husband got there before me. He rated it highly as you did but i still haven’t got around to it. So much of Mumbai is being redeveloped with eye watering cost apartments so ordinary people are being moved further and further afield with huge commuting problems then. No ‘Book at Bedtime’ or podcasts for me either, but I can do audio books because you can ‘rewind’ them if you need to. But not around the house, only in the car when I’m on my own. I think earphones are inherently antisocial. And also only books of a certain type. Anything meditative, or chronologically challenging, is no good at all, with one exception, and that’s Finnegans Wake read by an Irish narrator. That’s because it’s not as if I’m going to understand it anyway, and the sound of the words is just lovely. I read this last year, Lisa, and rated it 4.5 stars. As you say, the characterization was marvelous–I never strained to accept each party’s capitulation. And the ending – I, too, was dismayed. Hello Debbie, thank you for being careful not to reveal the ending. Yes, this is very much a character-driven novel, and Adiga gets it just right. Everyman has his price, is what most people think, and the anger towards someone who does not is more about the shame of capitulation than about the issue itself, I think. Did you review it? I’ll link to your review if I can have the URL please. I really dislike being invested in a character when it’s all going to end badly, an example for me is HHR’s Maurice Guest, but it happens more often with television where I will quite often just stop watching. Did you regret your decision to have a second go at this book? In passing, the law has been changed in WA so the developer can go ahead after 75% of owners accept his offer. Oh yes, but who could not love Maurice Guest, both the novel and the character?! No regrets, (and no spoilers either). I think it was a case of just being in a different head space, as they say.